It produces more protein than cattle. The UN calls it “probably the fastest growing food-producing sector.” It’s the most sustainable source of meat we got. And you’d be hard pressed to find it in the US. I speak of aquaculture, or the practice of farming fish. If there is a food source that can both help reverse climate change and feed the world’s hungry, it is aquaculture. And while much talked about alternative proteins, such as those made from plants and crickets and stem cells, will hopefully become an important part of a sustainable future, nothing comes close to the impact fish farming will have on world diets in the next 5, let alone 50 years. And yet, we simply don’t do aquaculture in the US — output is less than 1% of the global market. Americans have ignored aquaculture as a key piece of American food supply, which is a touch ironic. For one, the US is the third largest consumer of seafood in the world (after China and Japan, respectively). Secondly, the US used to be one of the most fertile fishing regions in the world. It’s been estimated that England derived greater wealth from fisheries in New England than Spain derived from gold in the Americas. But mining America’s shores turned out to be unsustainable, and by the end of the 1700s our fisheries were either degraded or totally destroyed. Over time, the US established rules limiting wild fish capture and many of our fisheries rebounded and stabilized, but wild stocks are still lower and our population is several hundred million larger than in the 1700s. Why the US has lagged in aquaculture. Unfortunately for the US, fishing from wild stocks, however responsibly, turned out not to be the winning strategy for seafood production. The winning strategy, and the driver behind the rise of fish as the largest source of protein in the world, is aquaculture. Globally, wild stocks have been flat for decades, while aquaculture continues to be the fastest growing protein producing segment in the world, despite the fact it’s already a $232 billion industry in “first sale” value, likely representing well over $1 trillion in retail sales. Environmental barriers. Our climate and waters are not great for the types of fish Americans like to eat. Regulatory barriers. The permitting and compliance process surrounding aquaculture is a nightmare — where it’s not impenetrable. Environmental barriers to US aquaculture. For the most part, Americans eat three types of seafood: shrimp, salmon, and canned tuna. That’s 55% of all seafood consumed in the US right there. Unfortunately, shrimp like to get farmed in near-tropical brackish water, which we don’t have much of. Salmon enjoy extremely cold, pristine waters near our poles, which we almost exclusively have in Alaska, and Alaska banned fish farming in 1990. Tuna — at least the canned varieties that we mostly eat — is almost all wild caught due to economic barriers — tuna require at least 10x the space and feed of shrimp and salmon. Regulatory barriers to US aquaculture. Outside Alaska, which follows the simple to understand law of “no fish farming,” the US regulatory framework is a well known nightmare. In 1983 the US Joint Subcommittee on Aquaculture commissioned a study to figure out why we were lagging behind in aquaculture. It found 11 federal agencies are directly involved in regulating aquaculture, and another 10 are indirectly involved. On top of this, over 1,200 state laws were found to have some significant bearing on aquaculture operations. Not much has changed since then. As a result, there is not a single commercial aquaculture operation in federal waters. Simply asking the question “can I farm fish here?” is a years long process that kills most attempts before they even break ground. The consequence for Americans is that we import 90% of all the seafood we consume. Fish that is domestic, like wild Alaskan salmon, generally gets processed in China (because of their massive scale and labor cost advantage) before coming back to the US. In short, it’s very rare for Americans to have access to fresh fish. And yet, despite our national ambivalence toward aquaculture, technology has conspired to make the United States the next logical seafood powerhouse. The short answer for why is RAS, or Recirculating Aquaculture Systems. If you’ve been to an aquarium, you’ve seen RAS in action. It’s simply a way to recirculate and clean tanks of water with fish in them. As mundane as that sounds, its potential is hard to understate. For one, it solves the environmental barrier that has prevented US aquaculture expansion. Because RAS is done indoors in a controlled environment, RAS operations can be tuned to different environments for different fish — warm brackish water for shrimp or the cold marine for salmon. In addition, it bypasses all of the messy state and federal regulatory impediments for offshore facilities. RAS operations can be implemented anywhere on land provided you have clean water and energy. To be clear, RAS has hurdles of its own. To date, the biggest one has been energy costs. Oxygenating, conditioning, and pumping water for millions of pounds of fish takes energy — the largest single cost in RAS outside fish feed. Luckily for the US, we’ve become one of the lowest cost energy suppliers in the entire world — lower than even China — due to the success of natural gas exploration. As fish farming becomes more automated, energy costs go up and labor costs go down. This creates a tipping point where America’s low cost of electricity makes domestic fish farming cheaper than imports from low labor cost markets like China and Thailand. This point is coming fast. Automation is accelerating due to diseases ravaging conventional aquaculture operations, which are less able to control diseases in the outdoors than RAS operations, which are entirely indoors. Thailand’s Chaeron Pokphand Group, the largest shrimp producer in the world, currently has 20% of its production in RAS facilities and expects the remaining 80% to move indoors within 5 years. 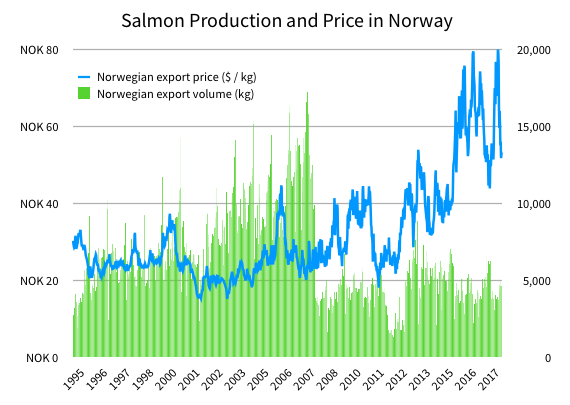 Salmon production has been flat for 10 years in Norway, the largest salmon producing country, due to sea lice (see chart below). With today’s RAS technology operated at scale, it is cheaper to farm salmon and shrimp — the two largest domestic seafood markets — in the US than it is to import. We just need to build those scale operations. Drill an injection well below the levels of any aquifers, below the level of any “confining layers” (the clay layers that line the aquifers), pump waste down there, and hope the discharge doesn’t leach back up into your aquifer. Build a discharge pipeline two or three miles offshore, discharge there, and hope it doesn’t leak anywhere along the way. This severely limits the potential locations for building a RAS facility with the right combination of geography, geology, and regulations to enable waste discharge. Projects like Atlantic Sapphire in Florida and Nordic Aquafarms in Maine have stated, explicitly, that they chose those locations because they could discharge their waste while also securing enough input water. But locations like these are limited across the US and are not necessarily close to customers or highways. For seafood, which has less than a week shelf life once harvested, locating farms for ease of discharge instead of ease of distribution burns precious time and money on every shipment. There is exactly one way to solve the discharge problem without creating serious environmental issues, and that is to have zero discharge. Luckily, fish discharge is some of the best fertilizer a farmer can ask for. For this reason, Chinese farmers have encouraged carp to swim around their flooded rice paddies for thousands of years and the Aztec built farms that floated above lakes stocked with fish. When designed correctly, 100% of the discharge of a RAS facility can be soaked up by plants or organisms that depend and thrive on the nutrients in fish waste. This approach of using the waste from aquaculture to power plant growth is called aquaponics. And while the most common designs pair aquaculture with vegetable production, other organisms hungry for nitrogen and organic nutrients, from mussels to seaweed to microalgae, can be produced commercially as well. Edenworks is an aquaponics company, and we run a zero discharge system. Zero discharge is not only possible, it’s a paradigm-shift for fish and plant health. The discharge provides a microbially diverse ecosystem, enabling more growth with less disease because all organisms depend on microbial diversity for health. Microbial diversity is so essential, in fact, there’s even a movement to consider the organism — whether it’s a plant, fish, or human being — plus its surrounding bacteria to be considered the “complete” organism, or “super-organism.” Without proper microbial diversity in our guts, sinuses, and on our skin, humans can hardly digest food, regulate our moods, and fend off diseases. And waste, it turns out, is one of the greatest (and cheapest!) sources of microbial diversity. While aquaculture around the world views discharge as a cost and risk, it should be aquaculture’s gift to nutritious food for centuries to come. And that can start here and now in the US. Fresh, local, and responsibly grown. Edenworks operates aquaponic ecosystems that use 95% less water than conventional farms, no pesticides, and generate zero runoff. Our home is Brooklyn.